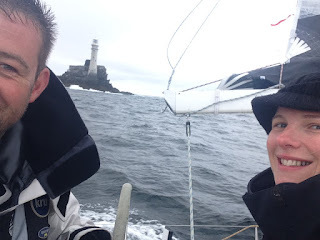 The beginning of the 2015 Rolex Fastnet was a whirlwind of emotions for me; excitement, anticipation and a bucket full of nerves. I was particularly thrilled to have my family there on the water that day to cheer me on! Our planned cautious start was possibly a little bit too conservative in the end, but we were certainly glad not to be over the line in those light winds. Tacking our way up the Solent amongst all those boats was epic, and Chris did an amazing job navigating his way through, and even avoiding a certain boat that got grounded right in front of us very early on. Light airs upwind are not a great combination for us on Nunatak, and the first 24-36 hours were particularly slow. We suffered even more with a major wind hole just to the east of the Scillies. With electronic problems and no means of getting updated weather reports it was an extremely frustrating time for us both, especially as we watched lighter boats sail on around us. When we finally got round the wind picked up and it seemed like a different race had started and we were finally on the move. Chris and I got into a great watch routine of swapping every couple of hours, and eating well with my wonderful home made cuisine (cough!). At least my Mum had baked a great loaf of Welsh Bara Brith to fuel us on. It was very breezy (gusting 25+kts) as we approached the rock, and not having 10 men sat on the rail meant that we had to put a reef in. It was also my first time on the helm in such strong winds at night – so took a bit of adjusting! As we rounded a rock we toasted with some bubbles, took the standard selfies and went on to enjoy what would really be an epic downwind home run. We peeled our kites around five times (hard work when there’s only two of you to manage an A2 kite), and probably didn’t drop below 8knts of speed for the whole journey back. Downwind helming in that wind was a major thrill that really was a first for me! Chris was beaming from ear to ear as he surfed down waves, making up for our lost miles in the first couple of days and ticking off one boat after the other. Our approach to the finish line saw us have a luffing tussle with The Sirens, which was great fun after a 600+ mile adventure. Although Chris is more used to podium positions in his sailing endeavors – for me I was just thrilled to have completed my first ever two-handed Fastnet in my first ever season racing two-handed. In what was an extremely competitive fleet I’m also very proud of finishing 124th overall out of 340+ IRC boats, 35th out of 72 in IRC2 and 30th out of 54 two handed boats. Overall under IRC this year, France claimed seven of the top 10 spots – not sure how the Welsh faired but I’m optimistically claiming that I was in the top 10 Welsh spots at least! What’s more I’m now absolutely addicted to short handed sailing and thrilled beyond words that Chris has agreed to keep me on as his co-skipper! I really can’t thank him enough for the opportunity, for the constant teaching and for making sure that Nunatak is safe to sail and race ready. 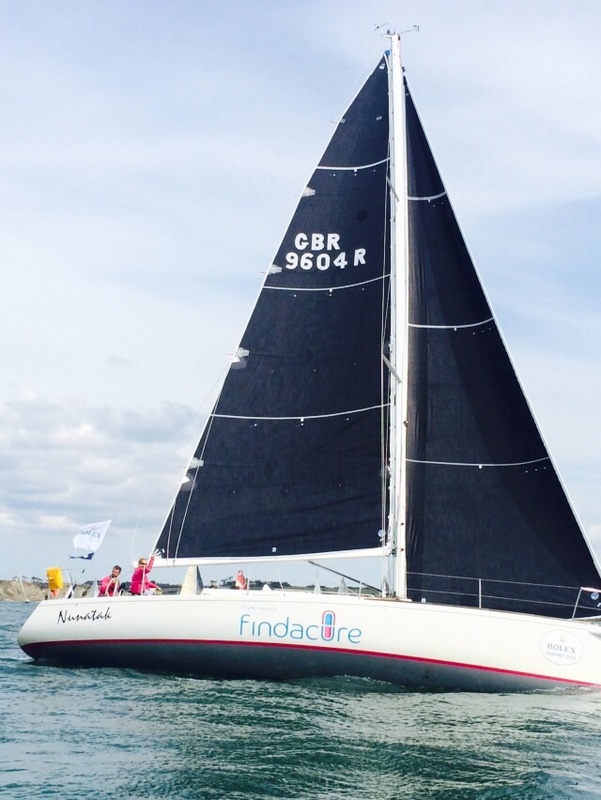 We proudly branded our boat and jackets with Findacure logo in a bid to raise awareness for this amazing charity that is closely linked to my professional career, and very happy to have raised over £800. Thank you so much for those that generously supported us. As always, it is really greatly appreciated.